So, why would you consider me instead of doing it yourself? A common misconception is that the service of a travel agent costs additional money, similar to that of a real estate agent. I also believed that! Many people do not know that a Travel Agent doesn’t cost you any more, unless the travel agent charges a service fee. A travel agent is paid by suppliers on a commission on a customer's booking. It takes time to research rates and suppliers. I am unbiased and book travel FOR YOU. I do not represent any supplier. So, my job is to go out and get the best options for you to choose from. Maybe you and your family are wanting to go to Disney and you have the travel dates in mind. With my research and resources I can save you quite a bit of money by maybe leaving a day earlier or returning a day later. How many times have you done something online and then had to call an 800 number to resolve an issue and after being on hold for umpteen minutes you get passed around to person after person who wants to continue to verify the information that you types into the phone at the beginning of the call and have now recited 17 times to yet another agent. If you have an issue, you pick up the phone and call ME, and I take care of it from there! Some suppliers will only deal with agents. As an agent, I am capable of getting rates and selections that you can’t get by going directly though the company or by such places as Expedia.com (among others). San Angelo Lifestyles Magazine Ad Spring 2015. Photography by Allyson Kitts with Photography That Moves You. Because I work from home, I am available any waking hour! You can call me during any reasonable hour and send me an email any time. I work for you. If I am awake – I will be reading your email! Most of my business is word of mouth and referrals. 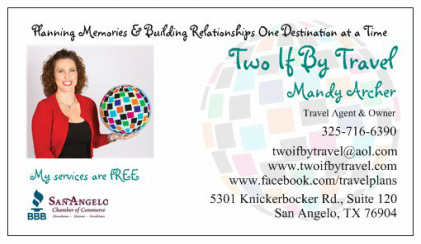 I will gladly give you a list of references that include doctors, honeymooners, repeat clients, corporate travelers... I go above and beyond to make sure your trip is perfect -- from the options I send, to the pricing, to checking you in for flights, to being available every minute of your trip -- all of this for the same price you would pay by doing it all yourself!